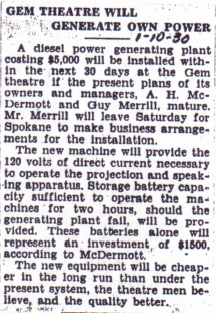 Originally planned to be called the Magnolia, the Gem Theatre opened in Omak on June 14, 1928. 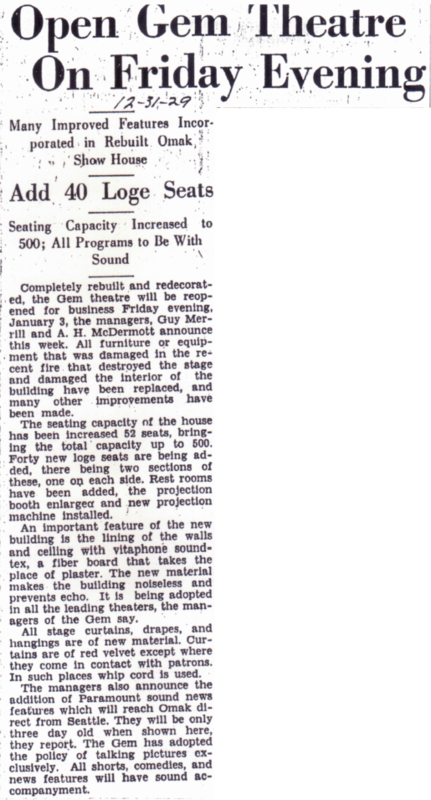 The 475 auditorium seats were built to order by the American Seating Company of Chicago, shipped from Grand Rapids Michigan and arrived in the "remarkable time" of 10 days via the Great Northern Railroad. On December 6th 1929 curtains, fixtures and equipment were ravaged during an afternoon fire of unknown origins. Damaging only the interior, the blaze caused no injuries, as the theater was empty at the time. As had been promised, the rebuilt and redecorated Gem announced its scheduled re-opening for business. Closed for slightly less than a month after the fire, it boasted upgrades such as loge seats and improved sound. New policy: "talking pictures exclusively"
The Gem's lobby ready to welcome patrons (photo courtesy of Ladd Studio collection at Okanogan County Historical Society). Although undated, it's likely from the January 1930 grand re-opening after the December 1929 fire. A new diesel generator will make the theater self-sufficient. The first Omak-built airplane was mounted on the Gem's roof as part of the promotion for "The Flying Fool" starring William Boyd (better known as Hopalong Cassidy) shown in 1929. The Okanogan County Historical Society's article in its Heritage quarterly drew reader memories to solve the photograph's mystery. 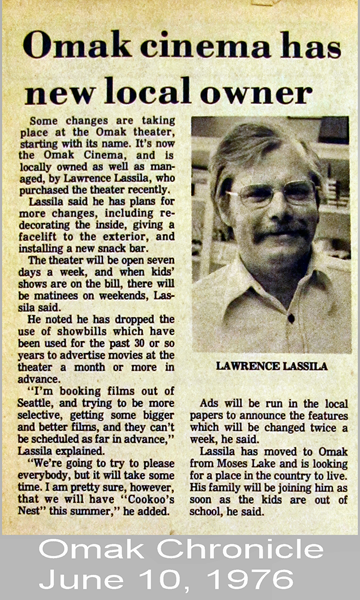 Former resident Roger Stuart Smith recalls the name change to "Omak Theater" sometime between 1938-40. In 2004 they opened the tri-screen Mirage Theater in the former Brownie's building at 101 South Main to join the (re-christened) Omak Theater that remains a single auditorium at 108 North Main.